When I went to the US, I had numerous beer goals in mind. One that I thought I would achieve pretty easily was getting the ‘All American’ badge on every beer geek’s favourite app, Untappd. I mean, I was going to be SURROUNDED by American beer, so surely this badge would just happen, right? The clue on Untappd goes like this – “Tough one here – drink the popular American beers (Coors, Bud, Miller) – plus a special Platinum beer from Bud…” I thought this was pretty self explanatory myself, but the last thing I wanted to do was waste the little beer time I had left trying random macro lagers. So to keep things simple I turned to the web to find a list of the 7 beers that I needed. But my Google skills failed me; all I found were posts complaining to Untappd…”I’ve drunk these 20 American beers, why don’t I have the badge? !”…It seemed I was going to need to use some common sense. So I went back to the clue. It mentions Coors, Bud and Miller – so there’s my first three. And since the most popular beers seem to be ‘Light’, I figured Coors light, Bud Light and Miller Light would be a sane choice. Then there’s the special Platinum beer from Bud, which I cleverly deduced to refer to Bud Light Platinum. That’s seven. Wait, could it really be that simple? Yep, it really was. I’ve no idea why anyone finds this difficult to figure out. I had this at the Ice Hockey in DC. The bartender laughed at me when I ordered it. I understood why once I started drinking it. The aluminium bottle is pretty funky though. Well…it’s in the biggest can I’ve ever seen. That’s something, right? It’s literally the colour of piss. As for the flavour…it’s hard to hate, because there’s nothing really there to hate. It’d be like hating water because you don’t like the flavour. It’s weird that the can doesn’t have an alcohol percentage on it. It looks like a bottle of SKYY vodka, which is kinda cool. It has a bit more flavour than your standard Bud Light, and honestly I like it a little bit more. There’s a certain ‘party popcorn’ quality that’s not offensive. This eventually turns into a flavour that I can’t explain – maybe it’s what the metal Platinum actually tastes like? Maybe it’s just the alcohol affecting me – how can a ‘light’ beer can be 6% ABV?! Read the Bud Light comments, because this is the same stuff. I did a proper colour test this time by pouring half the giant can in the toilet. Yep, just like piss. As for the beer itself – it’s better than Bud Light, and Bud Light Platinum…but not by much. At least the can is honest about the rice that goes into it. And I’ll ask it again – why do these cans need to be so damn big?! I had this while I was eating lunch, an absolutely amazing burrito. I finished the burrito, I didn’t finish the beer. So ended one of my worst beer experiences to date. 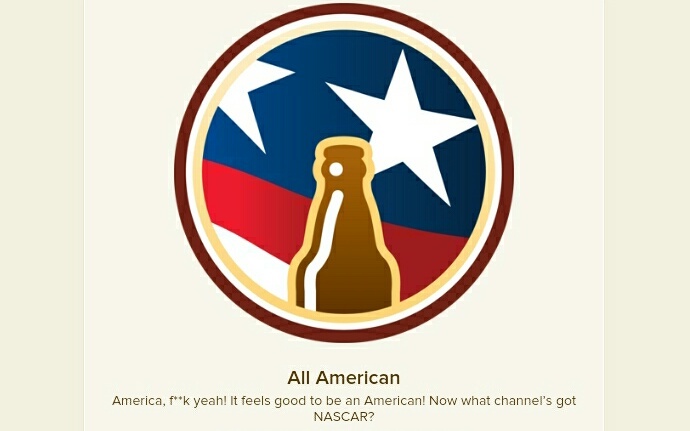 I only hope my efforts can help some people to achieve this badge without needing to try 20 random US lagers. May it also serve as a warning not to try all of these beers in one sitting – it’s an experience that I don’t wish upon anyone. I was at a wedding in Ontario on the weekend and saw the bar (initially a canoe filled with ice) was only stocked with these Americano beers. I remembered there was a badge for it on untappd, and decided to make the most of a bad situation. But I couldn’t check the specifics cos I didn’t have my phone on me, So i just threw down and drank what was there. I felt pretty comfortable that I’d covered enough to get the badge, And was genuinely devo that I fell short. I don’t want to waste precious beer time on this silly badge. 4 down (Bud, Bud L, MGD and Coors L) – 3 to go. Although, I’d rank them sub-sub-sub-sub-par in the overall beer universe, I actually don’t hate Bud, and am ambivalent to MGD considering what they are – remembering that it could be much much MUCH worse if the untappd guys whacked Natty Light or Milwaukee’s best in there. Reminds me of the time we discovered VB was actually better than Toohey’s New. At least, I saved the night by finally discovering Muskokan beers on tap at the real bar. And came home to my beer own stock ready for Origin tomorrow. If the ‘beer’ was free and the badge made of gold I would not have done what you did. I apologize that the USA makes this ‘stuff’. I’m back from Ireland and glad to report that the craft beer movement is alive and well. No need to apologize buddy, Australia has some awful ‘beers’ as well. We’re just lucky that we don’t need to drink them to get a badge. Good news about Ireland. It’s about time you started posting some stuff…travel and beer are a great combo for your first post! I’ll give it a try while I can still remember things. Should I post it here?